Just an aspiring lawyer talking about subways and sports and music. 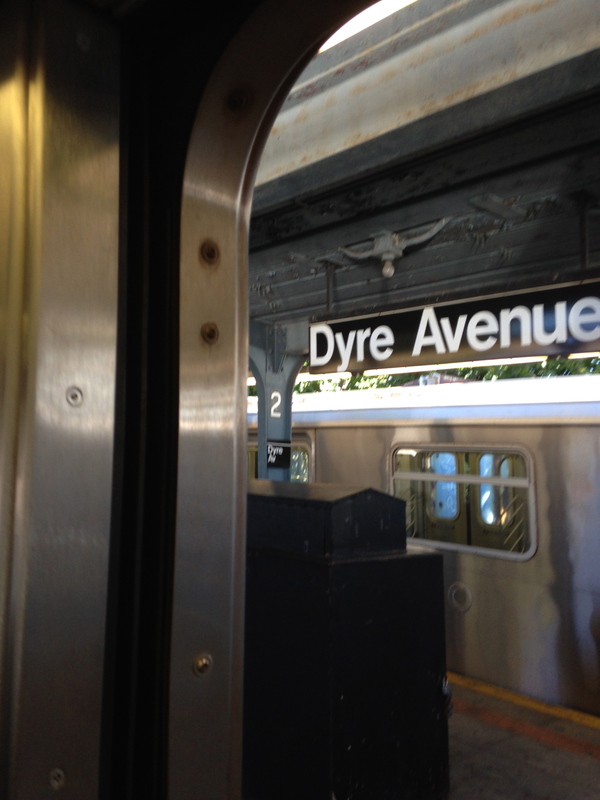 These may be the two least favorite words of anybody riding the New York City subway. Although I have never used the subway as a five-day-a-week tool since I moved to the city four years ago, I have accepted—or even embraced—the “don’t-bother-me” attitude that pervaded the country’s largest mass transit system. Sure, if somebody had a question about what transfer to make or whether they were indeed going toward Rockefeller Center, not saying anything would have been rude, but “good morning” never preceded one of these types of questions. That was reserved for the dregs of the subway social hierarchy: the panhandlers, or even worse, the performers. Every once in a while, there might be a person with a clipboard thrown in there, but they were equally seen as a disturbance (and likely far more awkward). On July 6, 2014, I got an email from my friend containing a link to an article accompanied by two words: “Beat them.” This was not out of the ordinary, as I have a bit of a reputation among my friends for being oddly obsessed with geography, infrastructure, and maps. For several years as a child, I was convinced that I was going to become a cartographer. While in grade school, I told this to everybody who would listen, at which point most people asked me why I wanted to be a photographer (as an eight year old, I did not speak particularly clearly). I figured I would add the story to the list of trivia I knew about the subway but never expected to use. Within an hour of receiving this email, I had created a spreadsheet for me to try to at least match on paper the 22 1/2–hour running time that the British team had achieved. There are 468 stations in the New York system, excluding Staten Island, and the record requires you to stop at every station on a train (no passing through on an express). The tangled web of stations in both Manhattan and Brooklyn require a lot of manipulating and cutting to minimize backtracking. As the subway itineraries are long and exhaustive PDFs, I calculated these schedules manually, which meant that it generally took at least three hours to come up with a route, check it for completeness, and then calculate the amount of time it would take. By late that evening, I was ready to call it quits. The best I could do was 22 hours and 41 minutes, and that was with several instantaneous transfers that I would be incredibly lucky to make even one of, let alone all. Transfers between subway lines must be made by scheduled public transport or on foot. While I received multiple assurances from Guinness that my planned route—despite the several running transfers outside the system—would receive consideration and potential validation, I was still worried. As I said before, my route is only calculated at a faster time than the 22:26:02 posted by the previous team because of my running ability and the fact that I planned to exit the system more than a dozen times. This would decouple the Guinness record from the recordkeeping of the Amateur New York Subway Riding Committee, which based on some cursory research appeared to have validated every Guinness record to date. Each contestant making the run must pay one token fare upon entering the Transit Authority system prior to the run, and until the completion of the run must pay no further fare nor reenter premises of the Transit Authority by fraudulent means, or [by] means of any sort of pass. In short, an ANYSRC attempt is done on a single fare, foreclosing the running transfers that I planned to rely on so heavily to take me under 22 hours and change. Although my friends urged me to keep moving forward, a sneaking feeling remained at the back of my mind throughout the planning. I was deliberately disregarding ANYSRC guidelines; what would the backlash be? I didn’t want to have to defend myself against the people who I hoped would be most interested in the record quest. Thankfully, thoughts about guidelines and anxiety over other people’s opinions of me had to be put on the back burner quickly. I was starting a new job on September 15, and with Guinness’s pace of doing business, I had to start planning almost immediately to make an attempt before then. Service changes, the bane of every New York City commuter, meant that even if I had found a good route, I would have to modify it significantly in order to make sure that I didn’t bypass any stops that might be temporarily closed or plan to ride lines that were either diverted or not running. For several weeks, however, there were too many simultaneous service changes to allow any variation of my route to move forward. The MTA did not always post all of their service changes more than a couple weeks in advance, so people I had asked to help time the attempt were stuck in limbo as I waited for a date. Finally, I found three workable days at the latest possible time: September 10, 11, and 12. I hurriedly arranged an attempt on September 10, and before I knew it, I was on my way out to a far-flung corner of the system with a partner and two witnesses. Although I was a bundle of nerves on the way out, once I got into action mode, the only things I could think of were the next station, whether my my proof requirements were all in order, and when I might be able to drink more liquids. Restrooms didn’t even register as a concern the first attempt, although we ultimately called it quits roughly two thirds of the way through due to a run of bad luck with transfers that we couldn’t recover from. (For the record (pun intended), since this seems to be what everybody is most curious about, I used the restroom exactly once on every subsequent attempt—there are a few dozen open ones left inside the system and I had noted where they are.) Buoyed by the fact that this record was a possibility, I then tried again on September 12, getting much further but still packing it in roughly an hour and 45 minutes short of my goal. I made one more attempt on Columbus Day before my attempt in January. 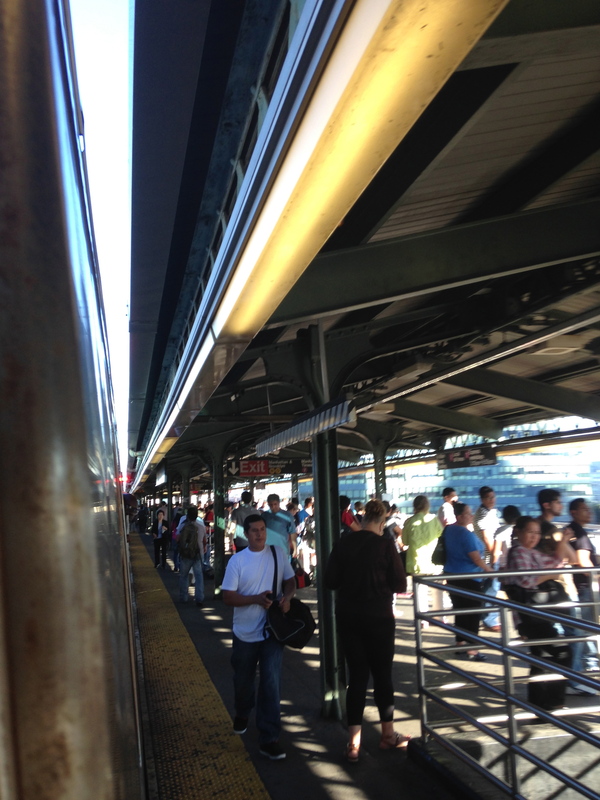 A wise man once said that hell is trying to board an Astoria-bound N/Q train at Queensboro Plaza at 5:15pm. That person probably never had to simultaneously comply with Guinness requirements. Guinness requires three separate kinds of documentation: pictures from each station, the log book, and the witness book. 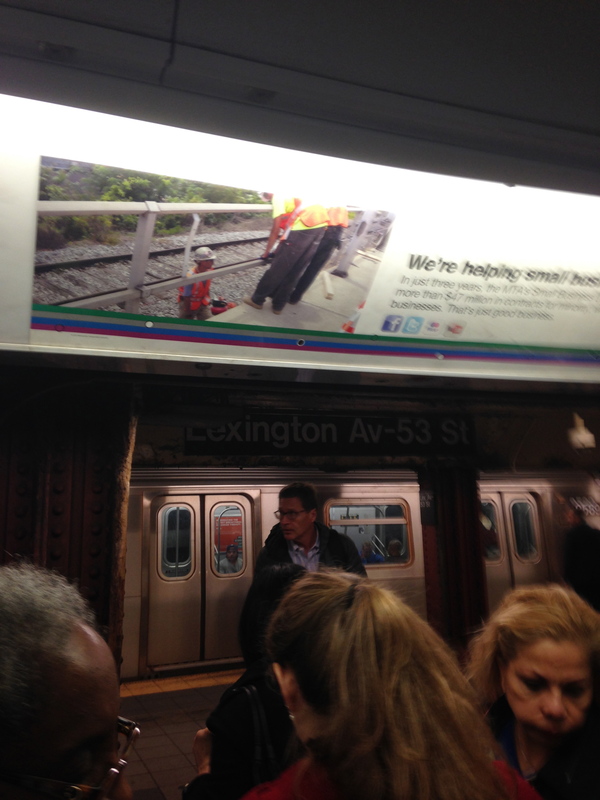 The pictures must demonstrate that you are inside the train while the doors are open. Over the course of taking nearly 2,000 pictures in the subway system, I have learned many lessons about trying to take pictures within a small window of time, particularly regarding making sure that the station signs are placed in focus as opposed to the random section of doorframe I need to illustrate. New Lots Avenue on the 3…not so good. The log book was not much better. Times for both arriving at and leaving each station must be documented down to the second. Since the only way I could think of making this metric consistent was to use the times that doors opened and closed at each stop, looking at my watch while having my logbook out compressed the time (and range of arm/hand motion) for pictures even further. Finally, the witness book. This requires a name, date and time, location, and signature from as many people as possible who can attest to your presence on the subway. Thankfully, Guinness guidelines stated that this was a “get as many as you can” requirement if attempting the record solo or as an unsupported team. On top of all this, visiting every stop in the system, regardless of route, requires dealing with rush hour, and the crowded trains can cause problems when you’re on the opposite side of the train from where the doors are opening. This is one of the better cross-train photos. 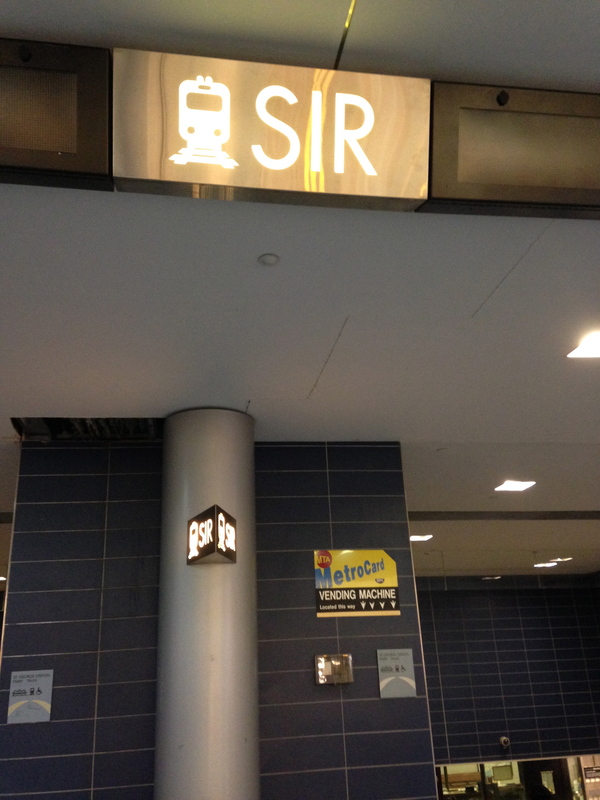 You can still read the station sign, and nobody is looking at me as if they’re confused or ready to deck me. It can cause even more problems when you’re trying to transfer at the same time. The running generally comes with a sense of urgency, especially when you need to exit the system entirely. During my first three attempts, I happened to transfer outside the system to an N/Q going from Queensboro Plaza out to Astoria between 4 and 6pm. For those unfamiliar with the station, the outbound Queensboro Plaza platform is on top of the Manhattan-bound platform, which itself is above a mezzanine where fare turnstiles are located. For a platform this far above street level, a running transfer from another train at a below-ground station means climbing the equivalent of seven or eight flights of stairs to get there. Managing to take a picture when you’re trying to squeeze onto a crowded train as the doors close on you, especially when you need to show that the doors are open and you can barely lift your arms from running, is generally an adventure. The one above is probably my best photo from all of those attempts combined. In conclusion, it’s probably a good thing that I did not want to become a photographer when I was eight. That’s a pen. Because I am incapable of using even an iPhone camera. To say I struggled with the witness requirements would be an understatement. Although I didn’t do the first attempt alone, which allowed me to devote more of my time to soliciting witnesses, it took me nearly all of the second and third attempts to figure out a workable system that would bring me maximal return for an investment of no more than 60 seconds at a time (since I had to always pause to take pictures and note times). Although I publicly gave the previous record holders a hard time for needing six people to break the record, I personally envied the ability that they had to split up duties so that nobody was doing so much that they might miss a station. At first, I solicited witness signatures individually. This was incredibly time-consuming and very draining, as I was talking to people constantly. Furthermore, people approached individually were incredibly unlikely to sign the witness book. Most people simply saw the list in my hand and said “no, thank you” before I could finish the first sentence. Ultimately, I realized by the middle of the third run that it would be easier to announce to an entire subway car what I was doing and then pass the witness notebook. While my success rate with this method was still low (and if I saw anybody sleeping, I became scared of trying to speak and usually backed off), I managed to get at least a fair few signatures this way, enough to balance out all the strange looks I would get from people who thought such an undertaking was frivolous (not that they weren’t correct). Though some people dismissed me as a curiosity disrupting their commute (which was not unfair), I was pleasantly surprised by some folks who did strike up long conversations with me over the course of these attempts. Perhaps my favorite was the nice old lady who I talked to on the D train in the Bronx on my final attempt. Once I told her what I was doing, she asked exactly what it was I did for a living, and I explained that I worked in criminal appeals. She agreed that this was a worthy cause, and then explained to me that the criminal justice system was a conspiracy put together by the Rothschilds to oppress minorities and poor people. Although I tried to cut off conversation, she insisted on continuing to talk to me about Christian morals for the super-rich and how the United States has corrupted those morals until I got off the train ten minutes later. I was so disoriented that I nearly forgot to take a picture at the station where I transferred. One of my favorite transfers was at Park Place/World Trade Center. I found this transfer interesting due to the layout of the station. 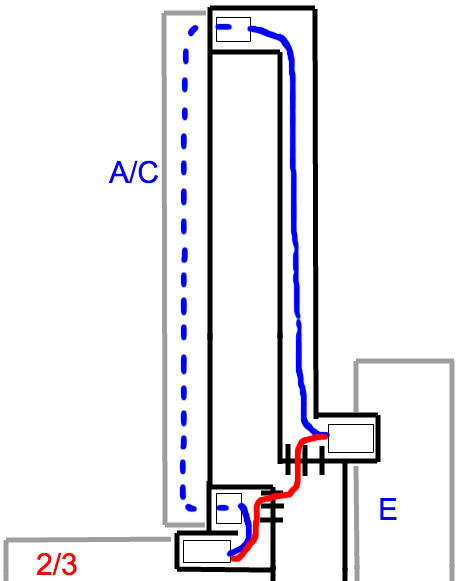 In order to transfer normally from the E to the 2/3 train, you have to take the stairs at the far north end of the E platform, walk several blocks north through a long passageway to the A/C platform, and then walk that same distance back south to take a stairway up (followed by several flights of stairs down) to the 2/3 platform (path marked in blue below). However, subway patrons who have unlimited passes, as I did, can ascend those same stairs from the E train platform, exit at the turnstiles, cross the hallway, and swipe back in at the stairs to the 2/3 platform (path marked in red below). She immediately stopped, turned around, and shot back, “No, excuse YOU!” before continuing to descend the steps at the same rate as the doors closed on the 2. Luckily, the display noted that only four minutes remained until the next train. The lady on her phone then ambled onto the train headed in the opposite direction that had just pulled in. Being an east Asian person, I generally have to deal with relatively innocuous but pervasive stereotypes. My wardrobe for all four of my attempts consisted of a T-shirt and either shorts (for the first three attempts) or baggy pants (and a jacket for my fourth attempt, during which the temperatures were in the mid-30s). 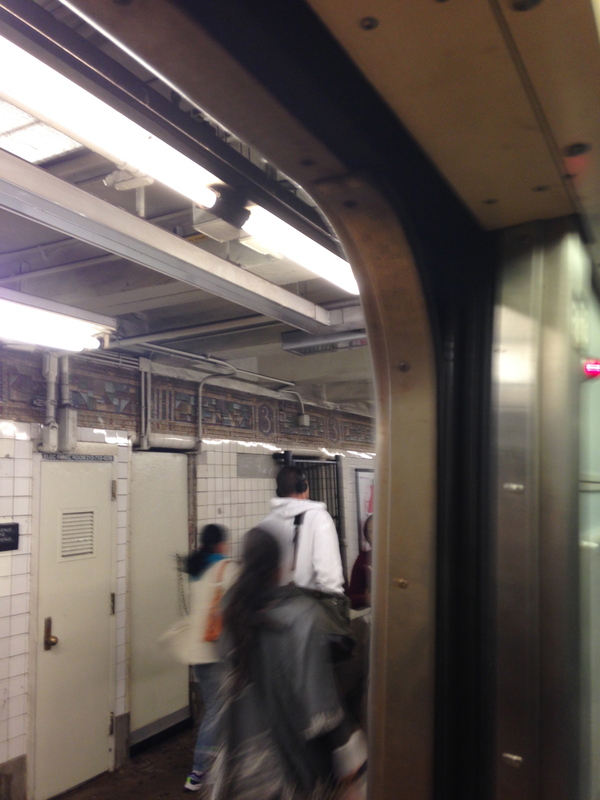 Because the subway is generally several degrees warmer than the surface temperature and I was only at surface level while running with a backpack, I tended to look underdressed on any line at any time of day. Combine this with incessant picture-taking and furious jotting in the log book, and people had a very particular narrative that they would project onto me. Of course, the fact that people view east Asians as generally nonthreatening (and the fact that my first-attempt partner was white) ended up working heavily in my favor, particularly considering what might be running through people’s minds had I looked vaguely Middle Eastern instead while doing all of these things. But who exactly is to blame for that, if anybody? 9/11 is fresh enough in the collective consciousness of the city, and it is still responsible for one lingering station closure (Cortlandt Street, on the 1, which is no longer even counted in the 468-station figure that the MTA and Guinness use). And regardless of blame, whose burden is it to change that? Is it the people themselves who are making these judgments? Is it the people in leadership positions who perpetuate these stereotypes who need to lead by example? Is it Guinness who needs to create an accountability and enforcement scheme that doesn’t create additional hazards for minorities attempting the record? (Where this gets tricky, after all, is not in the record itself—it’s only in the proof requirements.) Is this why every single record holder before me, with potentially as few as one exception, has been a white male? Other than comments asking whether I was working on a school project, the next most common question was about how I planned to deal with “unfamiliar” neighborhoods. Even those who themselves lived in these less-traveled areas were incredulous that I would be willing to ride (and sometimes run) through their neighborhoods. During my first attempt, I was discussing the pre-planned route with two passengers on the 2 train in the Bronx when I mentioned that we were going to take several transfers on foot, including from the end of the 2 to the end of the 5. Both of these people immediately tried to persuade me that it was not worth doing the walking transfer, even though it was the middle of the day and the neighborhood was not particularly dangerous. At a walking speed, the transfer was only a few minutes shorter than backtracking on both the 2 and the 5 trains, but I knew that any extra speed I might be able to muster would be well worth the exertion. While both of these people were worried about us getting lost in an unfamiliar neighborhood, I tried to express that I was confident enough in my navigational abilities to find my way to the other subway station. 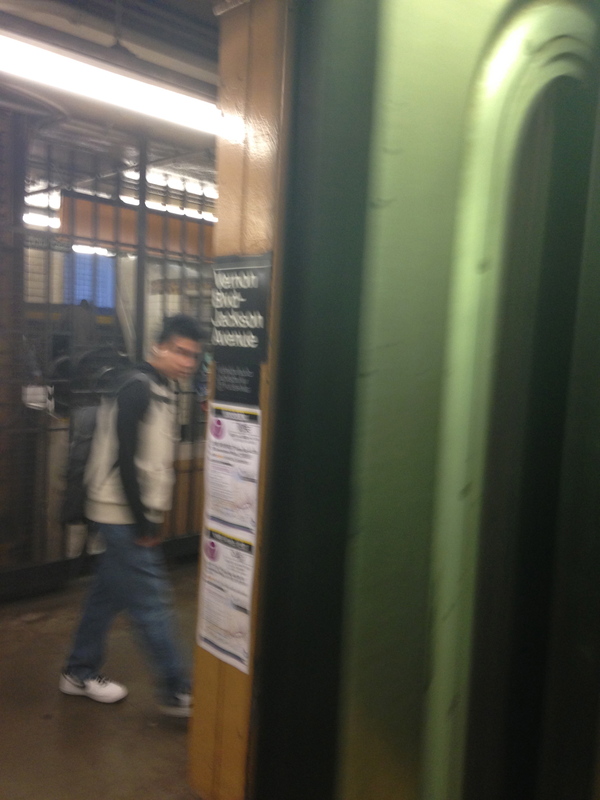 The picture of a typical subway rider changes drastically once one ventures even slightly outside this bubble. In almost all other portions of the city, the subway ridership was entirely working-class and, with some exceptions, very heavily tilted toward minorities. When English was still spoken, it was spoken with a variety of increasingly heavy accents. During my second attempt, I rode in the Bronx with a number of high school students in the early afternoon. One particular group of students that I sat near for close to 30 minutes spoke entirely in Spanish, even though their homework assignments were clearly written in English. Although my Spanish is rusty, one thing I did understand is that at one point one of the boys in the group, who was more interested in looking over his homework than engaging other people in conversation, mentioned something about trying to keep college options open. One of the “popular” kids in the group started making fun of him for thinking that he was going to get a chance to go to college. Quick transfers are one of the most satisfying feelings imaginable. Right as you arrive at the new platform, a train is pulling into the station, and you’re barely standing still long enough to exhale before you’re on a moving train again. This satisfaction generally follows significant amounts of stress, however, when the transfer you’re making is outside of the system. During my second attempt, I was off to a decent start, but an early running transfer had a problem: For some reason, the entrance to the uptown 215 Street station on the 1 was roped off. I could see that the next 1 train was due to arrive at 215 Street in four minutes, which left me with a dilemma: I could either run downtown to the 207 Street station and try to catch this next train there, or run uptown to the 225 Street station to buy myself an extra minute to run (but have to run much further). I chose to run downtown partially because it meant that I wouldn’t have to change direction after running down the stairs at 215 Street, and somehow managed to sprint to 207 Street just in time to see the 1 train pulling in. However, as any MTA rider could tell you, the card swipes are incredibly fickle, and it took me four or five swipes to actually get let through the turnstile. 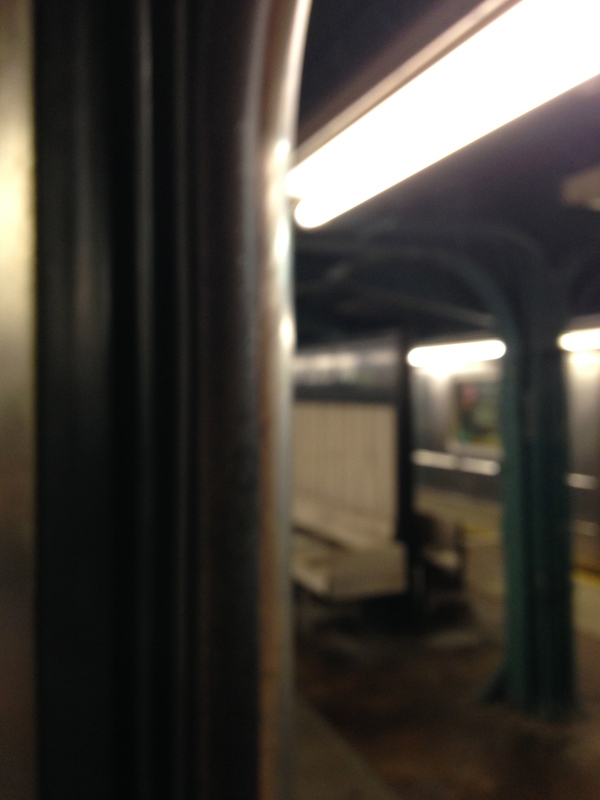 While I caught the train, I did not have much time for a picture before the doors closed. BUT IT LOOKS PRETTY GOOD. I don’t know how I did this. Seriously. During my fourth attempt, I planned to run to Vernon Boulevard/Jackson Avenue on the 7, a change I had made only the day before regarding a station I was unfamiliar with. While most stations allow you to switch directions without exiting fare control, I knew that the few stations where you couldn’t were primarily on numbered lines. However, as I was severely winded from my running transfer, I did not even think to look at the sign above the subway entrance to determine whether the station would let me access both platforms. I needed to board the Flushing-bound train, but I descended below ground without checking the direction of the platform and ended up on the Manhattan-bound side, at which point I realized I needed to exit, cross the street, and get on a train going in the other direction. I located a Flushing-bound entrance and pulled my card out to swipe when I got the error message stating that I had already used my card at the station and would not be let through. The Metrocards that are now in use in the MTA system allow you to refill either with value or with time (for unlimited swipes), and you can carry both on your card. Because the MTA does not want their unlimited cards to be abused, you cannot swipe the same unlimited card at the same station unless 18 minutes have elapsed. Because my card had several days of unlimited swipes remaining, it would not let me access the roughly $10 in individual fares I also had banked on the card. Therefore, with the rumble of an approaching train in the background, I had to run to a ticket kiosk, buy an entirely new card with fare, swipe through, and then try to take a picture and note the time before the doors closed. There are many variations on the “You know you’re a real New Yorker when…” trope. With the above situation in mind, my addition to this compendium might be as follows: You know you’re a real New Yorker when you can refill your card in under 15 seconds with the pressure of an approaching train. Although I did ultimately catch this train, this was probably the biggest scare I had up until that point in any attempt. The emotional letdown of just missing a train combined with the knowledge that I would have made it had I paid attention to the directional signage would have been incredibly disheartening even though I was still ahead of record pace at the time. He actually missed the train and may or may not hate me forever. During my third attempt, I boarded an L in Canarsie going into Manhattan. Wanting to avoid crowds, my general practice was to get in the first car. Through the first several stops, I noticed that the number of people in the car was abnormally low, even for the first car, and that many people were only taking the car a single stop. Being several hours into my attempt and with many running transfers already completed, I started wondering whether I smelled weird. Being equipped with a far-below-average sense of smell has had its benefits, especially in New York (and especially in weighing whether riding the subway for almost a full day was feasible). However, in this case, it rendered me unable to locate the reason for every other rider’s move into the second car until the conductor stopped the train with the doors open at Myrtle/Wyckoff Avenues and, while holding his nose, exited the conductor’s compartment and walked directly over to the only other person in the car, who was slumped against the end of a bench twenty feet away from me. “Last stop. Can’t stay on the train.” The passenger slowly sat up and groaned, as if in pain. “Don’t make me do this the hard way.” The passenger started to pick up various items scattered around him. First, a bag that had been sitting on him when he was sleeping. Next, a paper cup full of change. Third, a jacket that he eventually put on with great difficulty. Fourth, a cane that was almost entirely covered in duct tape. As he tried to rise while balancing his cup, it became apparent that his right arm ended at his elbow, explaining the awkward manner in which he had put on his jacket. As a result, he ended up letting go of the cane to stop the cup from falling and lost the cane, which clattered to the floor at the conductor’s feet. 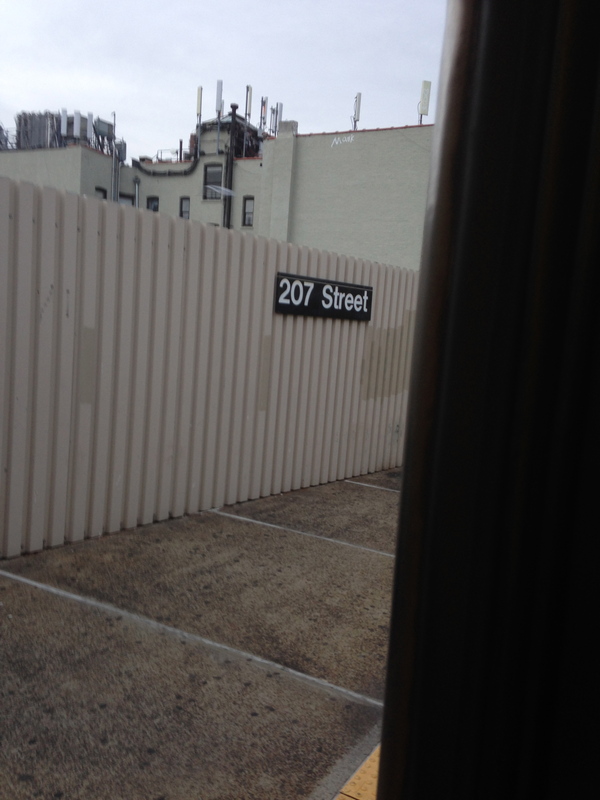 At this moment, the passenger looked out the door of the train car and noticed which station it was. He then spoke, deliberately and with some difficulty, but without any uncertainty in his tone. “I will call security.” The conductor moved to stand in the door of the car and said something softly into a walkie-talkie. The passenger had finally retrieved his cane, but was sitting back down. After a prolonged awkward silence, the conductor got back in the front compartment, shaking his head, and restarted the train. The entire encounter had lasted about two and a half minutes (based on my log of how long the doors remained open), and likely would have lasted longer if it had not been for the frequency of the L trains and the backup the conductor would have caused. People at Third Avenue literally fleeing for the next car. One of the few people I struck up a conversation with during my third attempt definitely did not see me as an outsider. I was waiting for a train far uptown when a man, clearly a tourist, walked up to me and asked me how to get to a stop that was in the same direction as my train. After talking for a little while, we realized that we grew up only a few miles apart from each other, no small feat in New York, since I was raised in the Midwest. I later realized that he was the only person to ask me for directions over the course of all four attempts, perhaps because my constant picture taking and notebook scribbling was seen as strange. As I mentioned, I started a new job on September 15. This job primarily involves working on criminal appeals for indigent clients. The office I work for has jurisdiction over cases originating in Manhattan and the Bronx. Although there are many attorneys I know who live in Manhattan, many of the locations of the crimes we deal with are not from areas that are immediately familiar to your typical fancy (read: bougie) New York City lawyer. I couldn’t bring myself to tell him the real reason, so I made something up about how a previous client had also lived in the neighborhood. The chicken counter he mentioned was right outside the station and always smelled good. It didn’t help that all the food I brought on each run was nonperishable: bread, crackers, and energy bars. Nearing the end of my fourth attempt, I was not only ahead of record pace, but set to finish with over an hour (and potentially an hour and a half) of time to spare. I only had a few transfers left, and everything was going according to plan. However, as I approached Midtown for the last time, the F train had one more twist for me. I was approaching Coney Island on my third attempt, looking to transfer to the F train once I got there. At the time, I was roughly thirty minutes ahead of record pace with only a couple hours left. I knew that the F had switched over to the late-night schedule (most, if not all, trains running every 20 minutes). It was looking like I could catch the next train with a few minutes to spare. However, at the last stop before Coney Island, we were held by the dispatcher for nearly nine minutes. As a result, I missed that train by two minutes and had to wait. I begged the conductor of the following train to leave early, but we left at almost exactly the scheduled time (as that decision was out of his control). At this time, I was still a good twelve or so minutes ahead of record pace with only a few transfers to make. However, on my next pass under the East River, there was significant track work happening in the tunnel. We sat for several minutes waiting for the tracks to clear before we were allowed to pull through (at a much slower speed than usual). I ultimately arrived at my last transfer one minute behind record pace. I still had hope. This transfer was a running transfer, and while I was projected to lose another few minutes, all I had to do was lap one train and I would be alive. Although the transfer time was short and the distance significantly uphill, I managed to get to the platform just in time to catch the train I needed. I was once again two minutes ahead of record pace. In order to have your record validated, you not only need the three pieces of proof that you assemble over the course of the attempt, but also a witness who sees the beginning of the attempt and one who sees the end of the attempt; they will need to start and stop a stopwatch that you cannot carry with you over the course of the attempt. Because I was expecting to show up half an hour early, I had two witnesses waiting for me at the second to last station on my route for much longer than I had anticipated, outside in relatively chilly weather. I hoped that they wouldn’t kill me when I showed up (particularly if I were still ahead of record pace). I knew that if I reached them by the 22:22 mark, there was a shot that we could reach the last stop in under four minutes. However, there was additional trackwork on this line. It was not significant, but it was enough to slow down the train so that I picked up my two witnesses just past the 22:24 mark. Although both of them were still optimistic that I could make it to the last station in two minutes, I knew that this would be nearly impossible. We ultimately pulled into the last station in just about four minutes, officially stopping the clock at 22:28:13. I had finished, something I had not done in either of my first two attempts, but I was 2 minutes and 11 seconds slow (over the course of 22+ hours). I thought I was done, as I was exhausted, starting to feel sick, and could in no way imagine going through that entire process again. From earlier in the day. 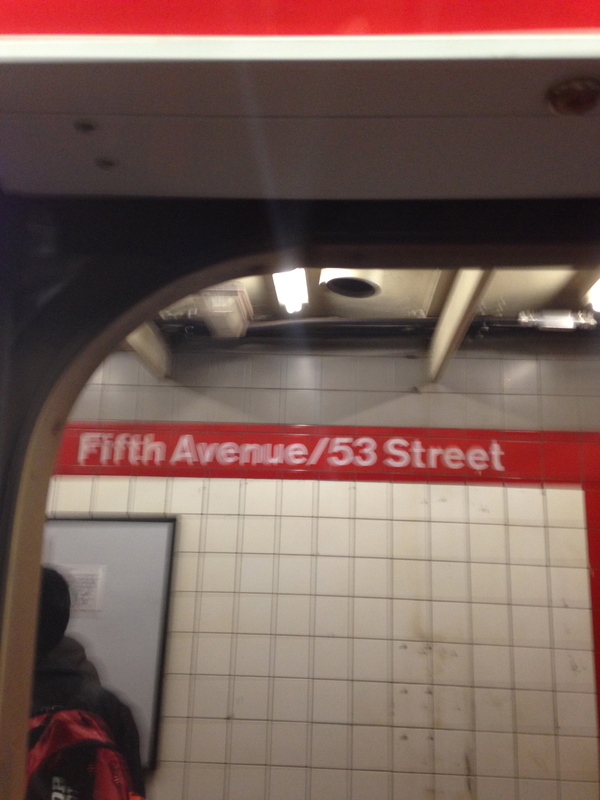 When I saw the distinctive red tile of the Fifth Avenue/53 Street stop on my fourth attempt, I could not comprehend the situation. I immediately sprinted to the conductor at the center of the train, who happened to be the exact same conductor of the 12:42 F from my third attempt. 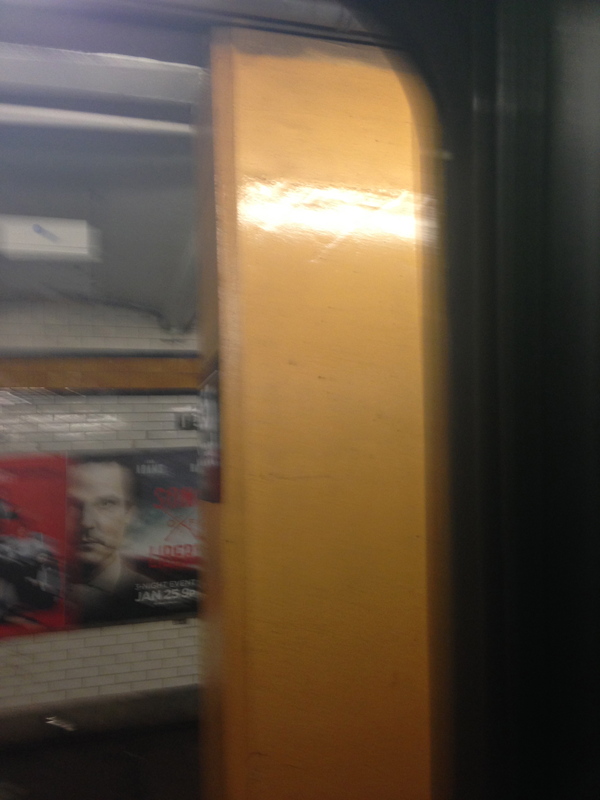 (I nearly lost it at this point, convinced the subway gods were playing tricks on me.) He said that there was a signal malfunction along the F track, and that Queens-bound F trains would have to run along the E/M line into Queens. 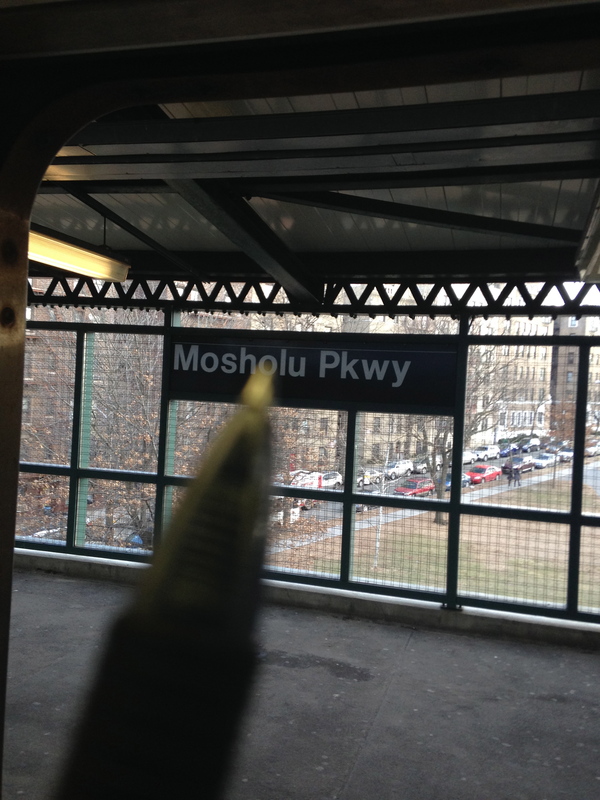 He noted that transferring to an F going in the other direction would be possible in Jackson Heights. However, backtracking to that extent would add another 20 minutes to my attempt in addition to any delays that had happened simply as a result of the diversion away from the F line. Furthermore, I was worried because a late-night service change also diverting Manhattan-bound F service was going to go into effect in about 45 minutes. I was so distraught that I completely forgot to log the times and take pictures at each of the stations along the E/M line. Luckily for me, I had already visited each of these stations earlier in the day and thus already had those pictures and times. To minimize the backtracking, I improvised a running transfer in Long Island City to hit the remaining F train stations and managed to catch one of the last Manhattan-bound trains not diverted. During my first attempt, my friend and I got behind very quickly very early. As a result, I became a little disheartened and started eating a bunch of my food around the six-hour mark. Since I had not slept well, the food made me drowsy and thus it was very difficult for me to keep my eyes open, let alone log times accurately, for the next two hours. At Marcy Avenue on the J, I nearly fell asleep entirely, at which point I told my friend that we might want to call it a day. He told me that we should keep going until it would be nearly impossible to catch up to record pace, even under optimistic circumstances. As a result, we continued on for another seven hours, making up significant time with the walking transfers but ultimately succumbing to my too-optimistic transfer predictions. He is the primary reason why I felt like this first attempt was a success, and why I decided to try again. At my third attempt, that friend was serving as one of my two witnesses. My frustration at finishing two minutes slow almost made me let go of the idea again. However, his observations about how far ahead I had been and the excitement of my second timer, who repeatedly told me that I had “proved the concept” on the way back, made me at least keep an eye out for days that would have favorable service changes, which is when January 16 fell into my lap. Without either of them, I likely would still be two minutes and 11 seconds short, a time that would haunt me even more than it still does now. I have had further help from a large number of people who served or offered to serve as timers, witnesses, moral support, editors of this rambling essay, or what have you, and people who were generally interested in the endeavor (as opposed to (or sometimes while) telling me that this was a crazy scheme). It would be impossible to thank them all here, but I would not be here without all of them believing not only in me but in a concept so ridiculous that it’s near-impossible to explain using just one sentence. You da real MVPs. Even though Staten Island isn’t necessary for the record, I felt like things were…unfinished. So I took pictures at every station and logged times the next day like a nerd. Because I am a nerd. Guinness now has the materials. While I believe most of it is exactly what they asked for, there are a few things that I am aware may trip me up. If I do not get this record validated, it has still been an incredible journey. If I do, I will still have the utmost respect for the previous record holders, the team of six that managed to outrun all the timetables on a single fare, perhaps a more impressive achievement than my own. Maybe it’s good the ANYSRC rules are different after all. Update: As of May 12, 2015, I am officially the new world record holder. For my version of the MTA subway map removing all stations inaccessible to people with disabilities, click here. Congratulations on officially breaking our record! We also exited the system during the attempt to transfer between stations on foot (as I believe did the holders before us) so your record is indeed comparable to ours. Coming from the UK, we couldn’t do much on the ground research beforehand, so we had to hope everything came together in the short period we were in NYC. Although we had several delays on the day, none of them lost us too much time and we managed to break the record on our first attempt. In fact our record attempt was the first time we had ever visited most of the stations on the network. Maybe one day we will have to come back and try and reclaim our record! interesting to learn of subways and of the worse Browns games ever. Interesting listings….tough reading though…..brings tears to my eyes in a way.